After weeks and weeks of overtime work and frozen dinners, you finally got your paycheck. But instead of putting it into your savings account like the responsible adult you should be, you decided to book a spontaneous weekend trip to Chicago. So now what? 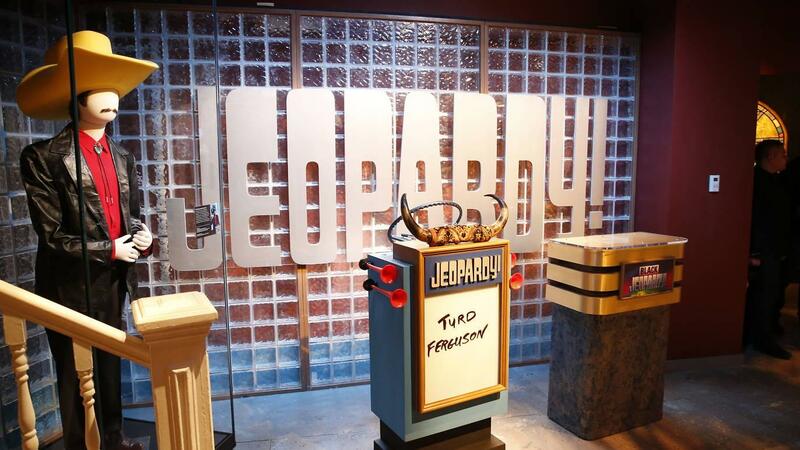 How do you know what the best things to do in Chicago are? Do you go and purchase Chicago travel guides from the local bookstore? Do you google Chicago trip planners? Or are you already pulling all your hairs out because the Type A personality in you forgot how stressful last-minute trip planning is? Well, hakuna matata because you’ve come to the right place. Without further ado, here is your ultimate 48-hour Chicago itinerary for a perfect weekend in Windy City. 1. Check-in at a boutique hotel. 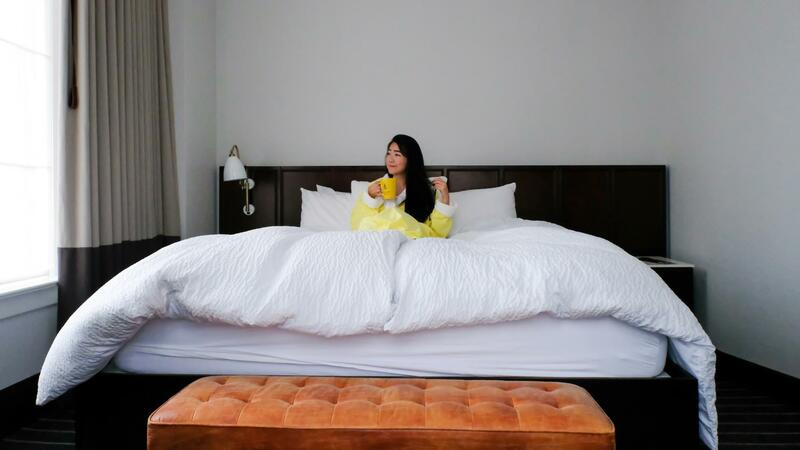 In “The Alise Chicago – A Staypineapple Hotel [Review]“, I was raving about the cutest and most considerate boutique hotel in the Chicago Loop area. 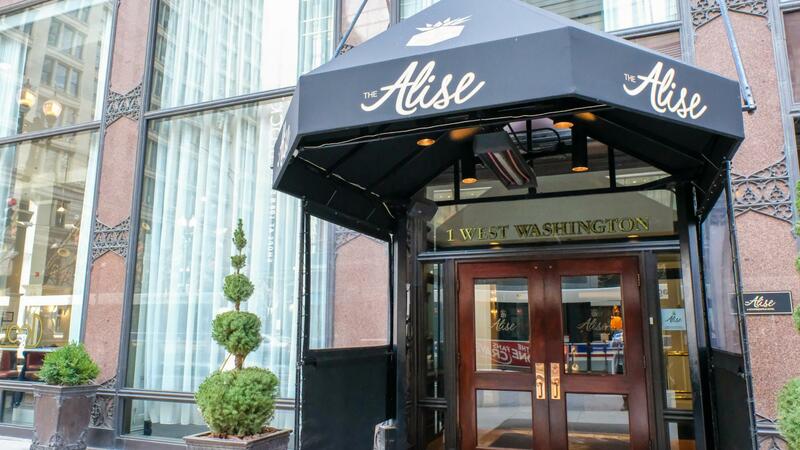 Not only is The Alise centrally located and within walking distance to Millennium Park, they absolutely go above and beyond to make sure guests have the most enjoyable stay. European style duvet. Comfy hotel slippers. Central charging station. Super turbo strength blow dryer. Unlimited drinking water. You name it! Oh! And it’s also housed in a historic building. 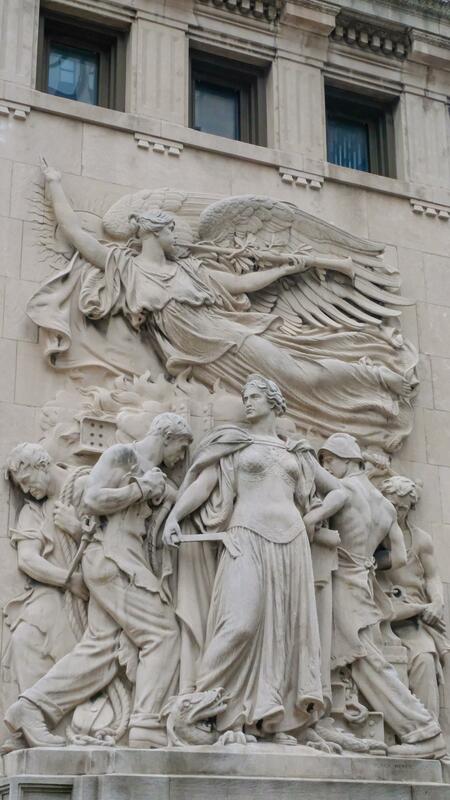 Experience quality stay AND get a taste of Chicago’s history. Talk about killing two birds with one stone! 2. Get lit! 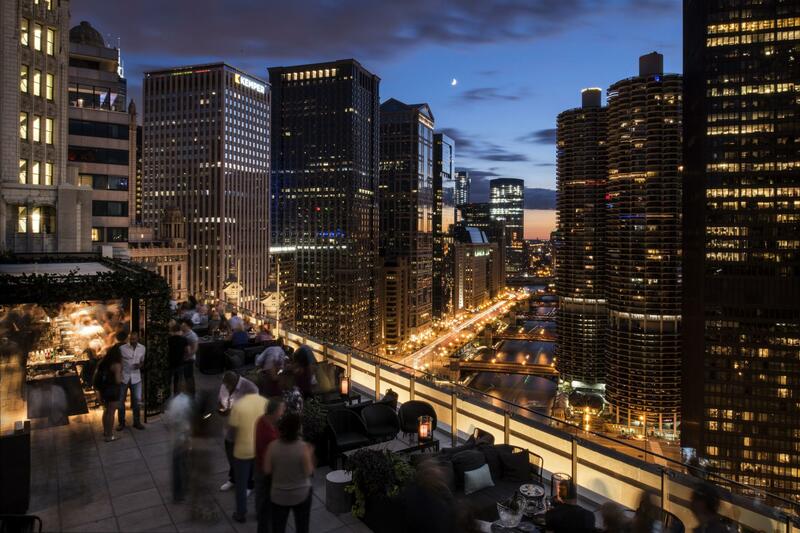 Hit up Chicago’s most popular rooftop bars!!! So you’ve had a long flight perhaps. Maybe you ate on the plane, maybe you didn’t. In the case that you are famished after check-in, here is a list of “Best Restaurants in Chicago 2017” for pre-game. 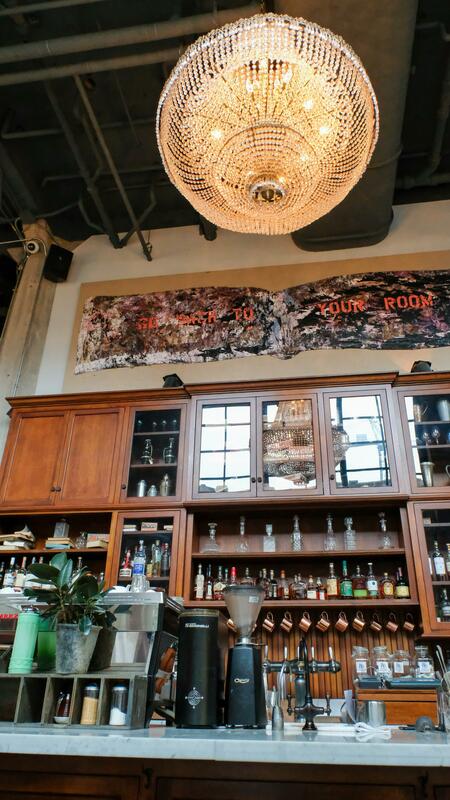 Better yet you could just opt to dine at some of Chicago’s well-known rooftop bars & lounges! 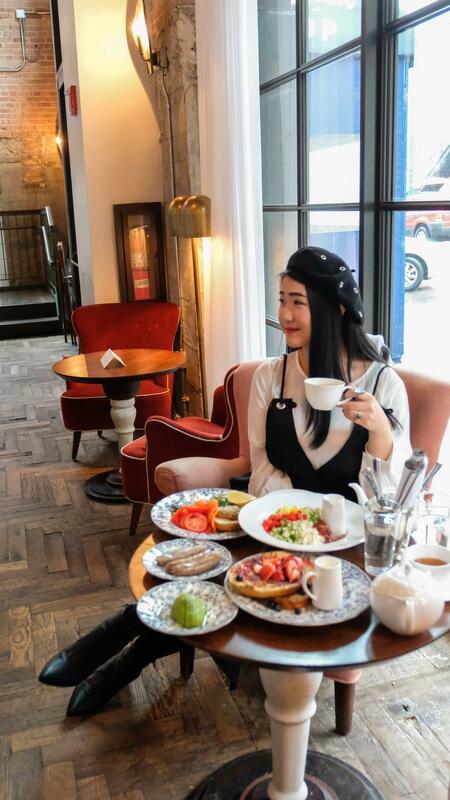 Photo from London House Chicago. Having appeared in popular online guides from TimeOut and Thrillist, LH Rooftop at London House Chicago is no doubt an absolute gem. 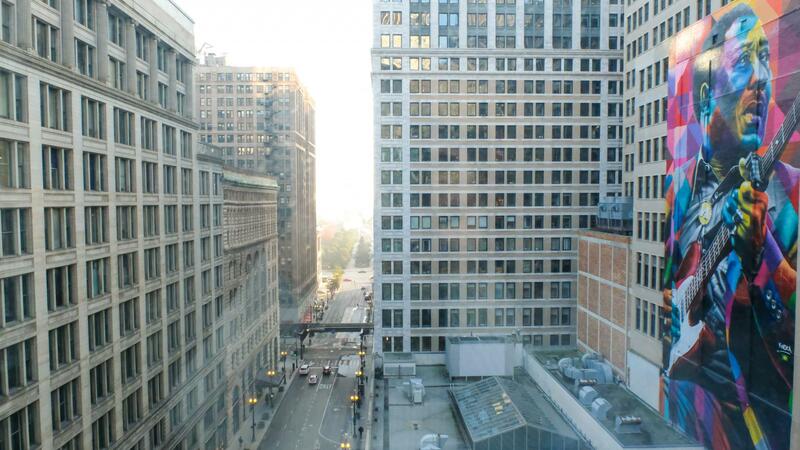 It is located on the 21st (indoor) and 22nd (outdoor) floors and offers panoramic views overlooking Chicago River and Michigan Avenue. Although more on the expensive and luxurious side, it’s certainly quite the experience sipping on a glass of bubbly here. We’re feelin’ snap happy ✨📷✨@Instagram crunched the numbers and named us one of the most-Instagrammed restaurants in the U.S.! 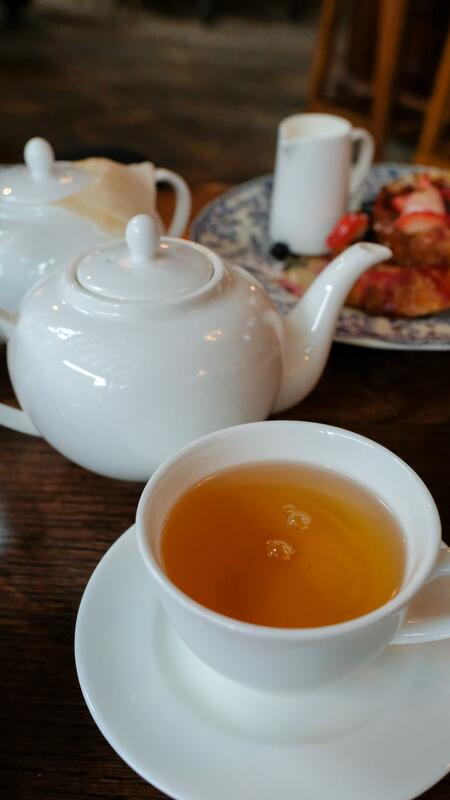 We love seeing our guests’ photos – we’ve rounded up a few of our favorites. Share yours with us when you stop in! 3. 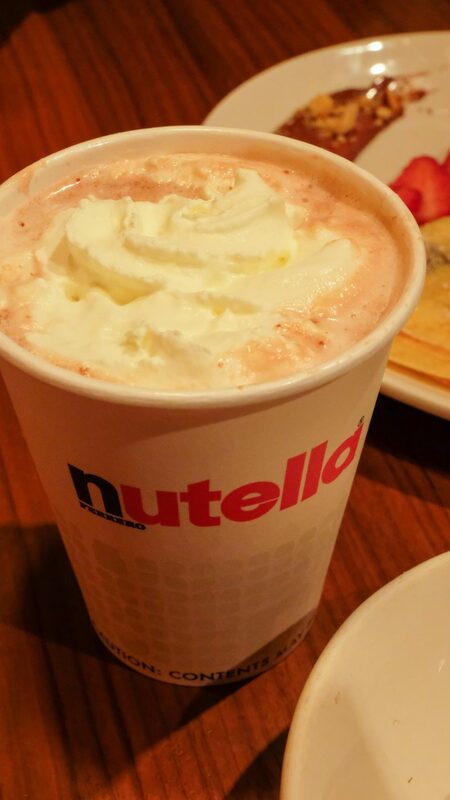 Start the next day with a cup of hot chocolate from Nutella Café. NUTELLA CAFÉ!? Yes! You read that right!!!!! I had no idea this magical place even existed until I was looking up things to do in Chicago. 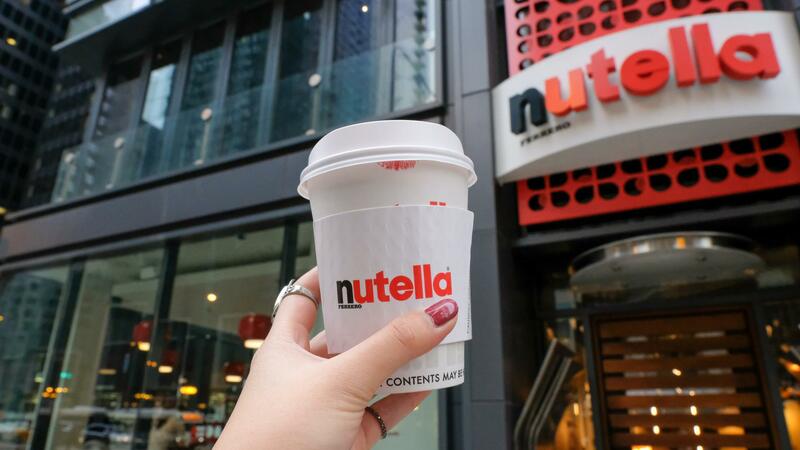 This is actually the first ever Nutella café and has only opened recently in May. Definitely a must for all you Nutella lovers out there. My friend ordered the crêpe, which she found to be nothing special. I do recommend the Seasonal Fruit Hand Pie however. The pastry dough had a nice flaky crust and the blueberries were a little tart but paired with the sweetness of the hazelnut Nutella sauce drizzled on top, it was divine perfection. Their menu includes a hot chocolate/cocoa. Ask the server for their special Nutella edition! Oh and if this doesn’t satisfy your sweet tooth craving, Leigh from Campfires & Concierges has some fantastic Chicago donut shop recommendations you mustn’t pass up! 4. 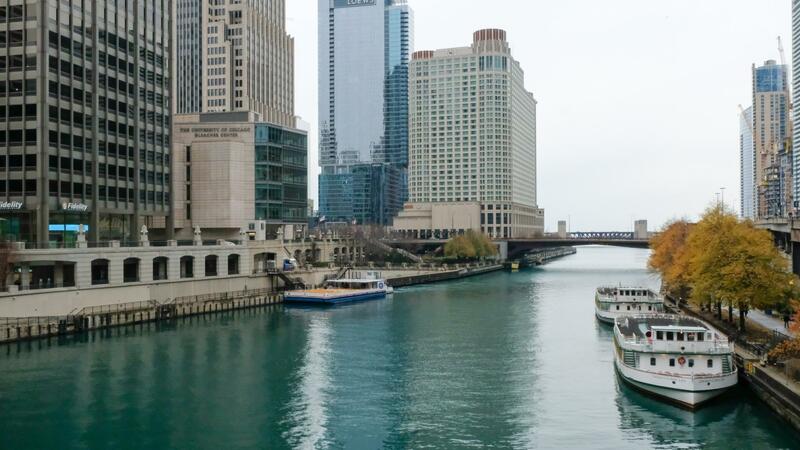 Stroll the Chicago Riverwalk. Real Fake sculpture by Scott Reeder in front of Trump Tower. On a good day, you can see the beautiful turquoise color of Chicago River glistening in the sun. Victoria from A Traveling Translator commented on my previous Chicago post to let me know that the river is actually dyed completely green on Saint Patrick’s Day. Surely that’s a sight not to be missed!!! For those that don’t care much for the night life, do still check out LH Rooftop when you’re in the Riverwalk neighborhood. We easily took the elevator from the hotel lobby up to the 21st floor then walked a few flights of stairs to the 22nd outdoor terrace. Even though the lounge was technically closed during the day, a security guard saw us but did not say anything. I’m assuming it’s allowed? If not, this could be our little secret, shh! The elevated city view was simply spectacular. Such a shame the weather didn’t co-operate with us because I can’t begin to imagine how much more incredible this scene would’ve been on a sunnier day. Highly recommended! For more on where to find the best views in Chicago, head on over to My Ticklefeet’s “Best Rooftop Views of Chicago for Free” guide. 5. 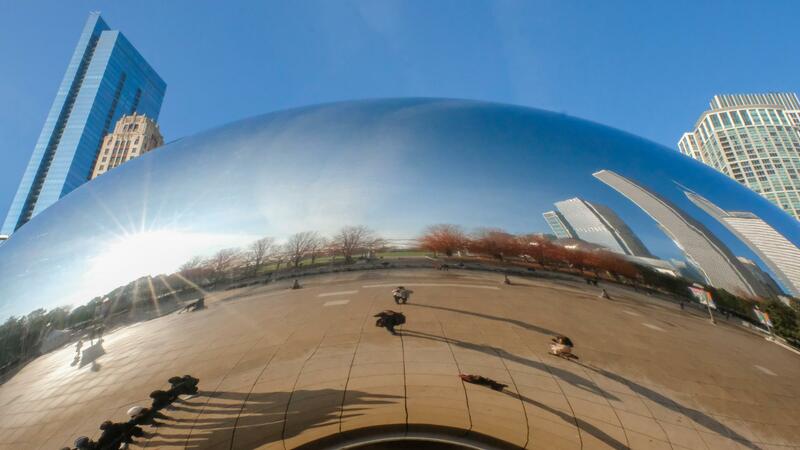 Take a reflection selfie at Cloud Gate, Millennium Park. Ahhhhhhh yessssssss. The giant jellybean! This is probably on everyone’s what to see in Chicago bucket list. 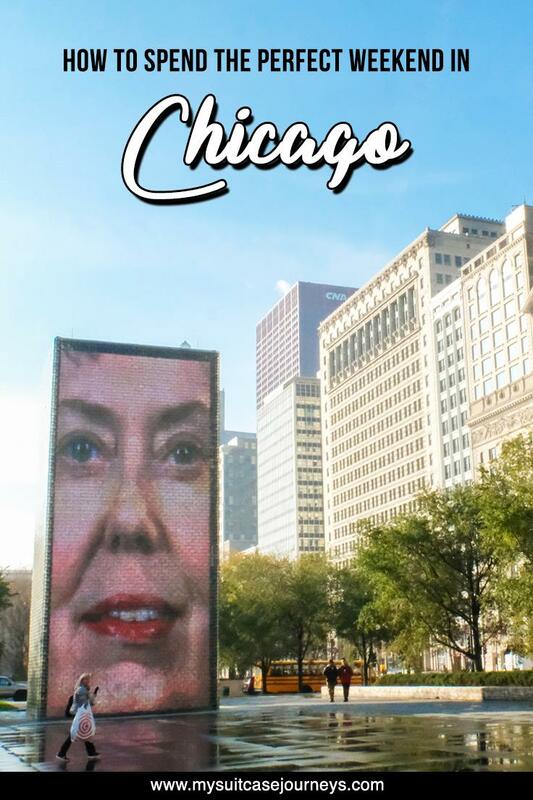 How can we forget about this Chicago icon! I don’t know why but after seeing photos online, I pictured it to be gigantic. It turned out quite a bit smaller in person, but still quite a fun photo op location. 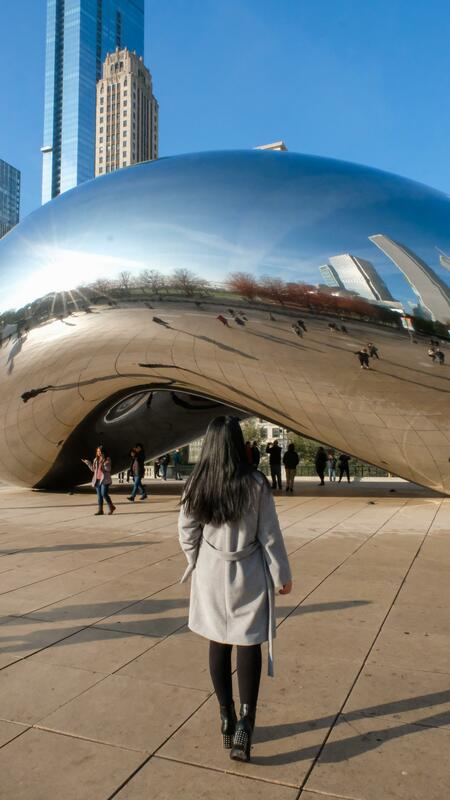 Cloud Gate was created by Indian-born British artist Anish Kapoor. It was a submission piece for a design competition in which he was inspired by liquid mercury. The sculpture is made of stainless steel plates and there are no visible seams. 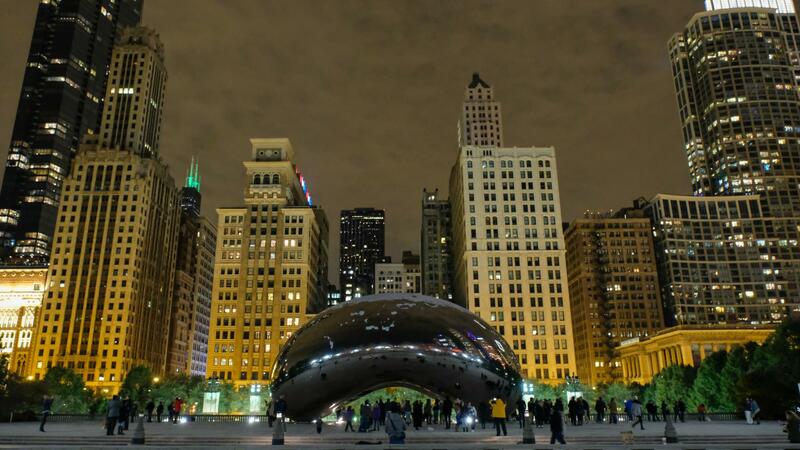 Although questions and concerns were raised during the initial implementation phase of this project, the bean has since gained local popularity and international fame. Cloud Gate at night is quite lovely as well. 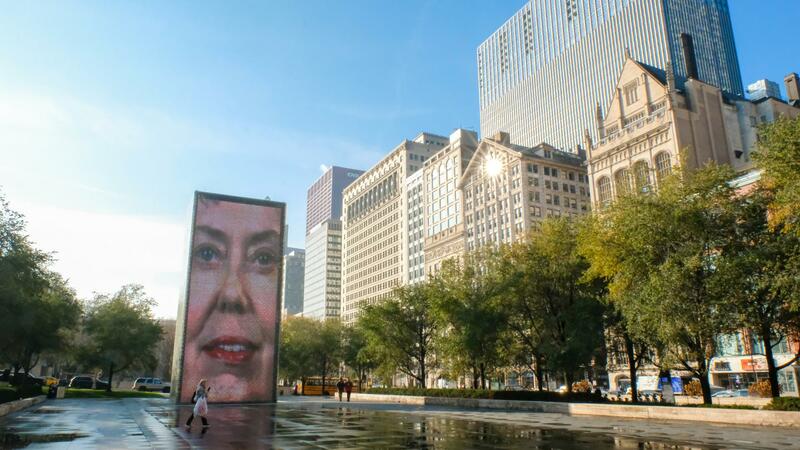 Also don’t forget about the Crown Fountain while you’re at Millennium Park! 6. 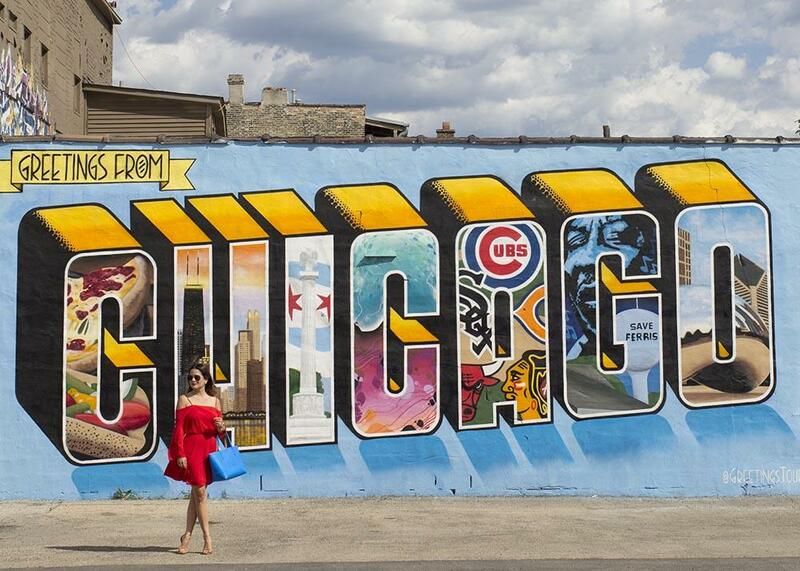 Hunt down Chicago’s IG-famous murals. 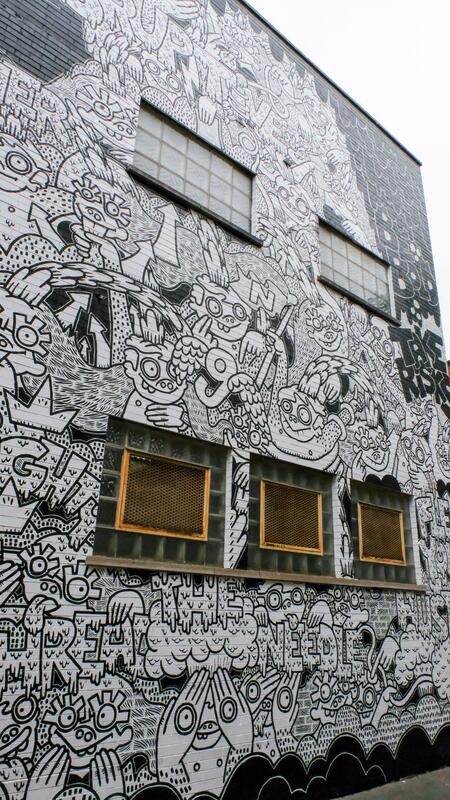 What I love about a mural is that it transforms a simple, blank space into the canvas of a creative mind. Again, my trip took place during a colder, rainier month hence I didn’t spend much time outdoors. The Muddy Waters mural was seen from my room at The Alise. The other two I spotted on my way back from brunch from The Allis @ London House to the Chicago L Pink Line station in the Fulton Market District neighborhood. Don’t have the exact addresses but these two were definite showstoppers. Below are other murals I recommend seeing and ones I’m excited to check off my bucket list for my return visit. 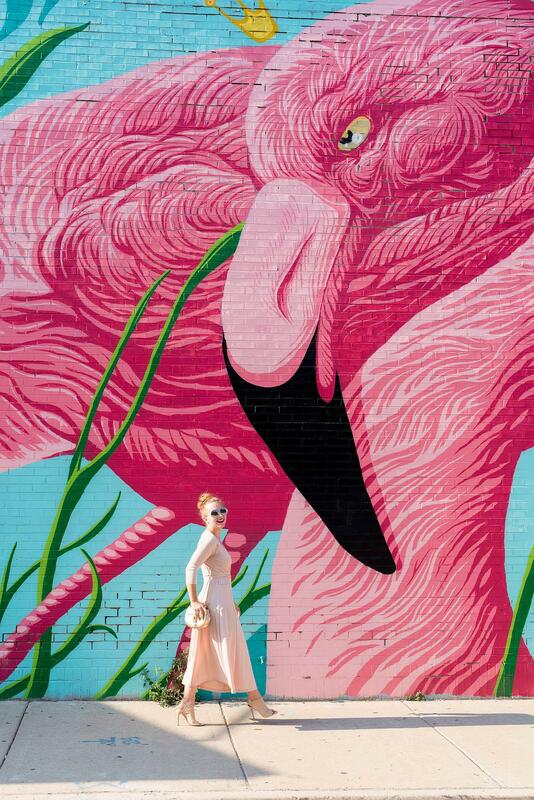 Despite having seen several Instagram photos of this insanely cute flamingo mural, I didn’t find out it was actually located in Chicago until after I got back home. The Flamingo Rum Club is a Cuban restaurant and rum bar. Their interior is absolutely darling as well although there are some mixed reviews. 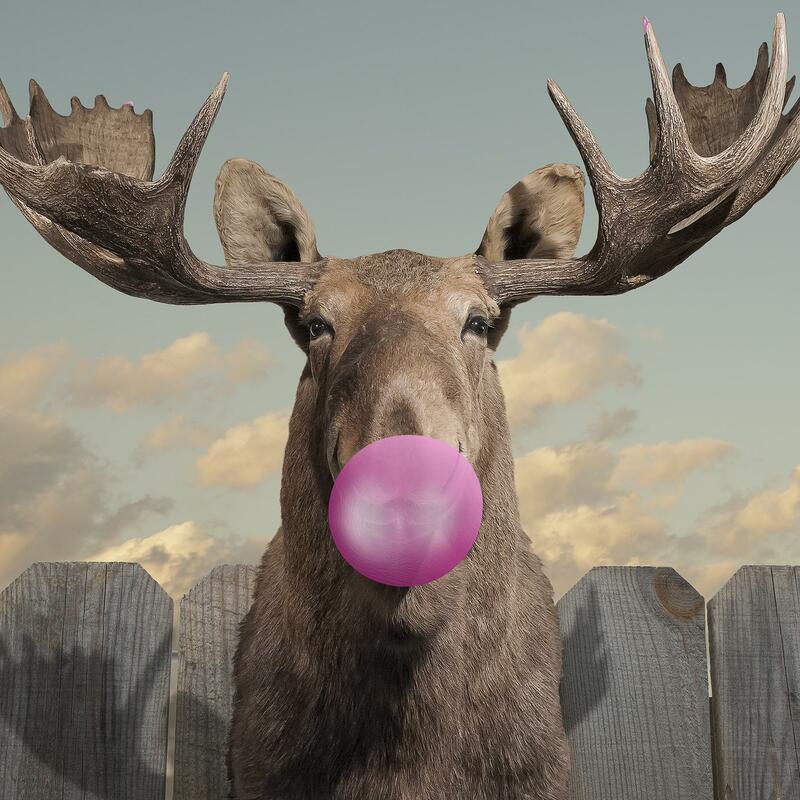 “Moose Bubblegum Bubble” by Jacob Watts. Photo from WAC. 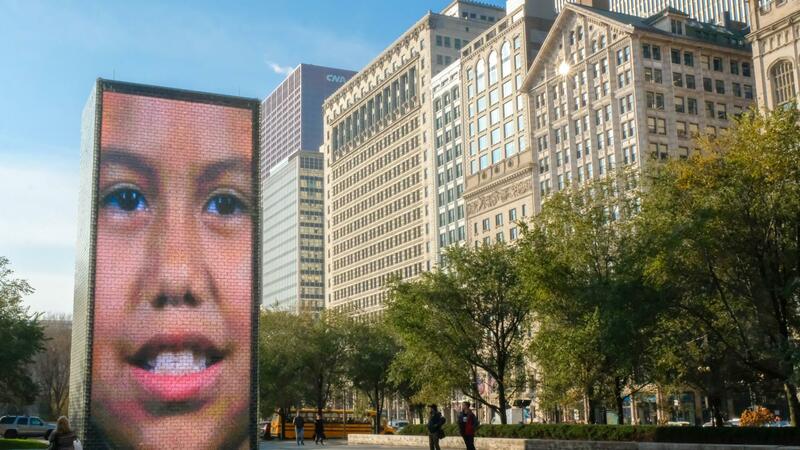 In 2013, Columbia College Chicago launched the Wabash Arts Corridor project to encourage students to get in touch with their creative side to transform and beautify the South Loop business district. 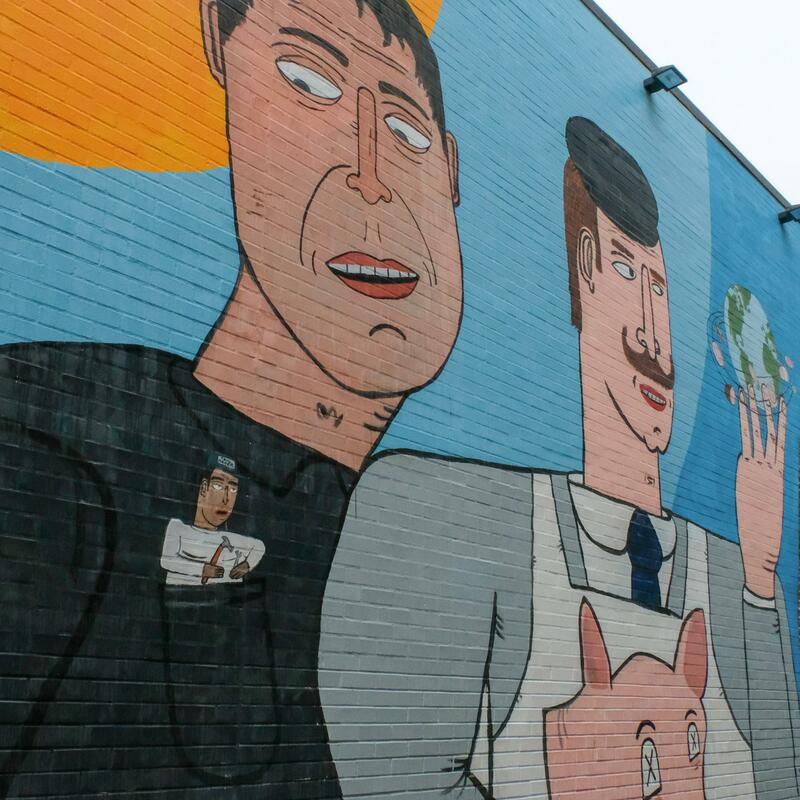 According to their official webpage, “The Wabash Arts Corridor is Chicago’s living urban canvas that connects the visual, performing and media arts.” Jacob Watts’ bubblegum mural is only one of the many student projects commissioned by WAC. Here is a complete list of their artwork. 7. 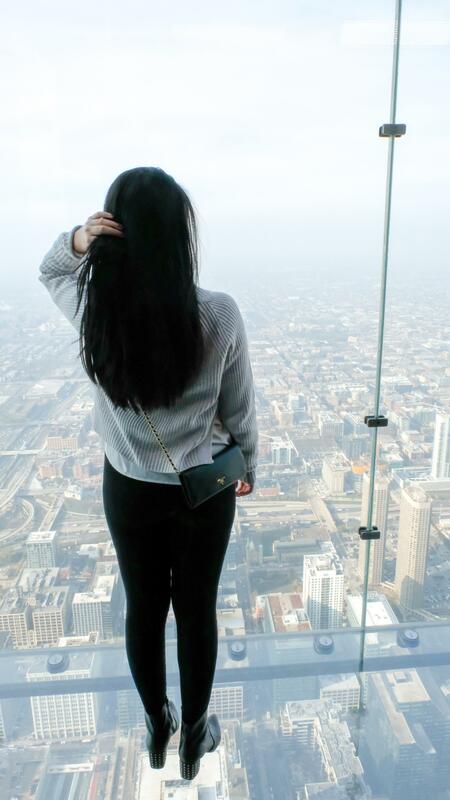 Enjoy sunset at Willis Tower’s Skydeck Chicago. 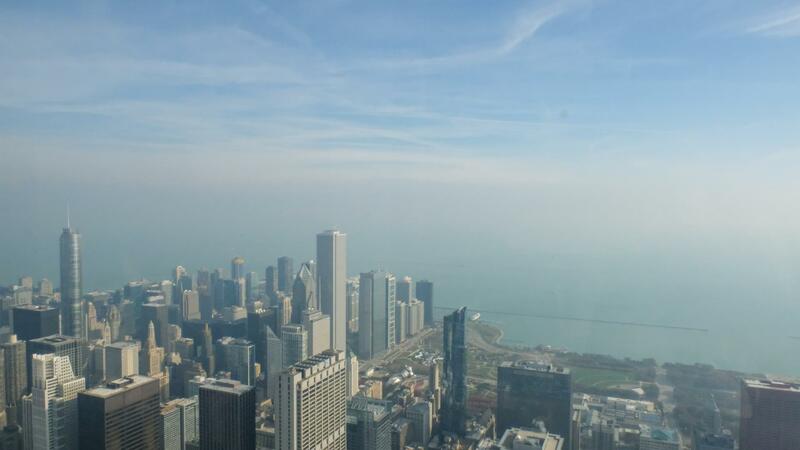 My “6 Chicago Tourist Traps to Avoid” post revealed that Skydeck is not worth the money. I am, however, putting this on the list because it is an exceptional experience for those who have never been to a glass-bottom, see-through observatory deck. Just be prepared for long lines and note that you also only get a few seconds on the actual balcony. (There are four queues in total. No time limit for the rest of the observatory.) If you have a DSLR, make sure you set your settings right for back-lit photography. 8. Laugh out loud at Saturday Night Live. Photos from Time Out Chicago. 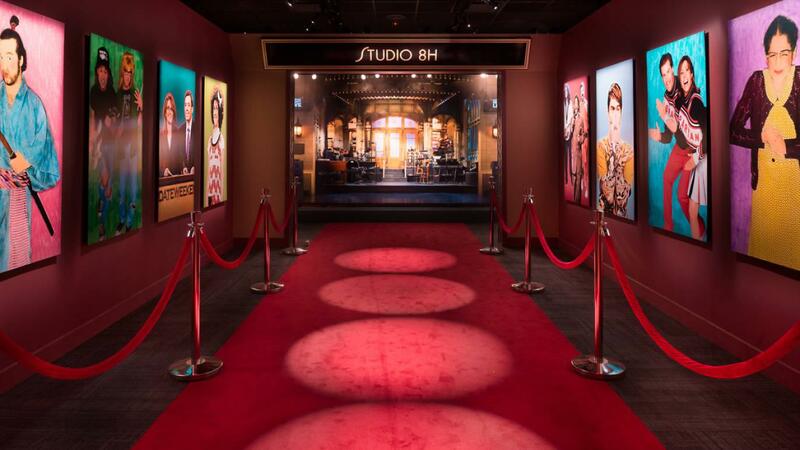 On October 21st, Chicago introduced a Saturday Night Live: The Experience exhibition that showcases all the behind the scenes top secrets of this three-decade-old TV legend. 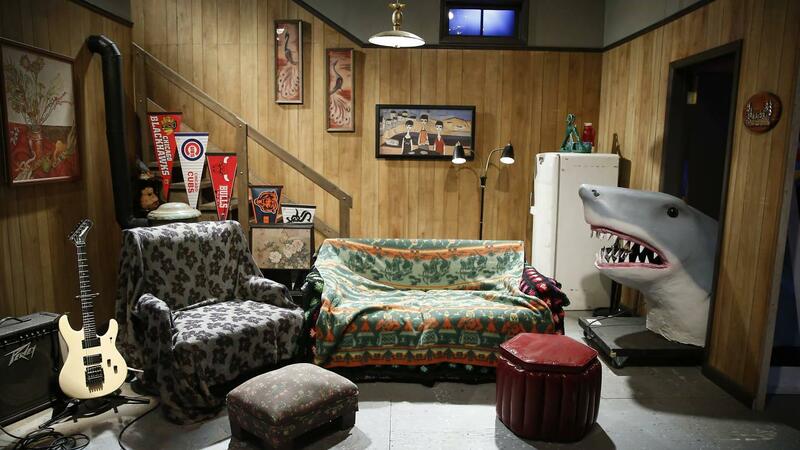 The exhibit is structured as a week in the life of SNL. You’ll see how the TV events come together each week with Monday being a meeting with the guest host, Tuesday the writing session, Wednesday the table read, and so on all the way up to Saturday’s live performance. From costumes and set pieces to original scripts and artifacts, you get to experience what it’s like running this classic American production first hand. Please note that this is a traveling tour and is set to run for 14 months in Chicago. Tickets are $25 so if you’re a fan, be sure to plan accordingly for your Chicago getaway. 9. Rise and shine! 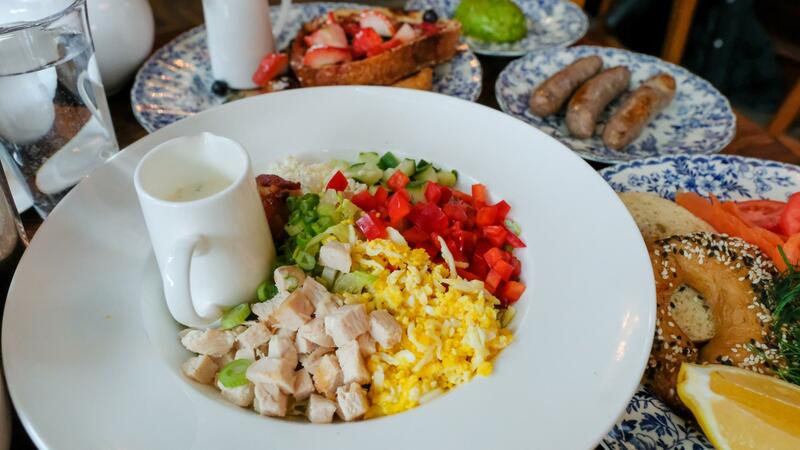 Brunch at The Allis Soho House. It’s the last day of your weekend in Chicago. Let’s get some food in you and start the morning right. 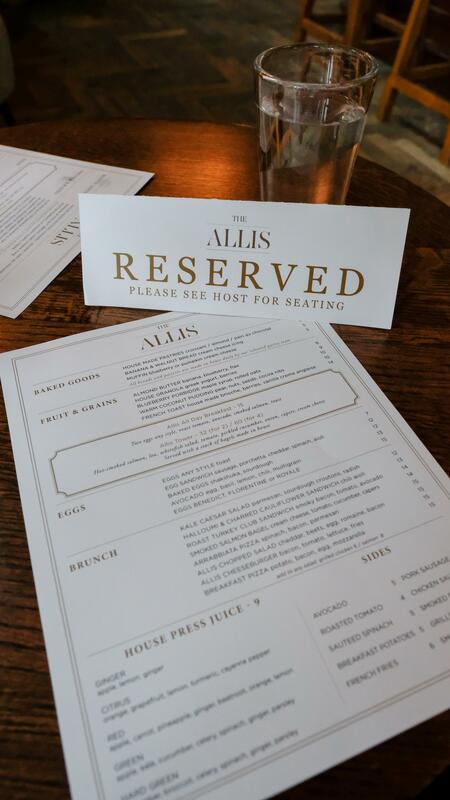 I had the pleasure of dining at The Allis thanks to the Soho House team’s kind and hospitable invitation. My girlfriend and I definitely ordered a little too much but everything on the menu looked to die for! I must say the food was phenomenal. 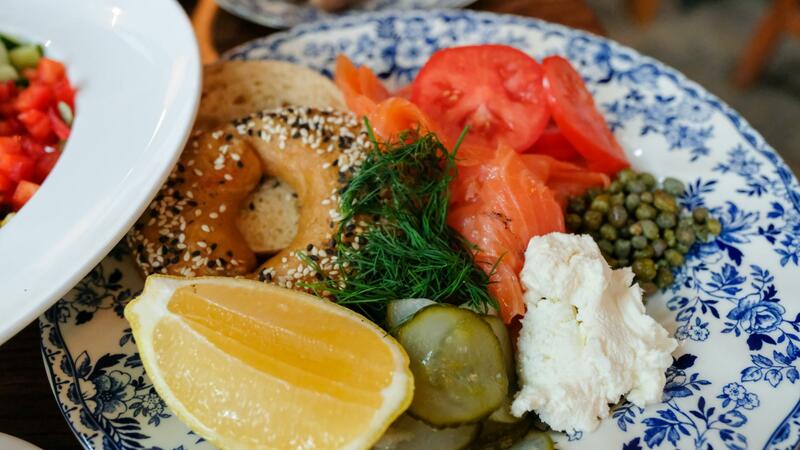 The Smoked Salmon Bagel, in particular, was absolutely delightful. I liked how they didn’t assemble it and you could add how ever many slices of salmon or tomato you wanted. Super cute dining space too perfect for a casual girls date or even business meetings and group celebrations. No wonder it’s featured as an Instagrammable spot in so many online blogs! 10. Frolic down flower paths at Garfield Park Conservatory. Silly me put this on my “places to see in Chicago” list and completely forgot about it due to my gold fish memory. Guess I got one more reason to return now! The conservatory is often referred to as “landscape art under glass” and occupies approximately two acres of land with an additional 12 acres of outdoor gardens. Their mission is to educate and inspire visitors through innovative programs and botanic experiences.. Admission is based on suggested donation. By the way, if you’ve watched the classic Vince Vaughn and Kevin James movie – The Dilemma, you might even recognize the Fern Room where Ronny planned on proposing to Beth. Ready for your Chicago trip? Book a hotel today! And there you have it! 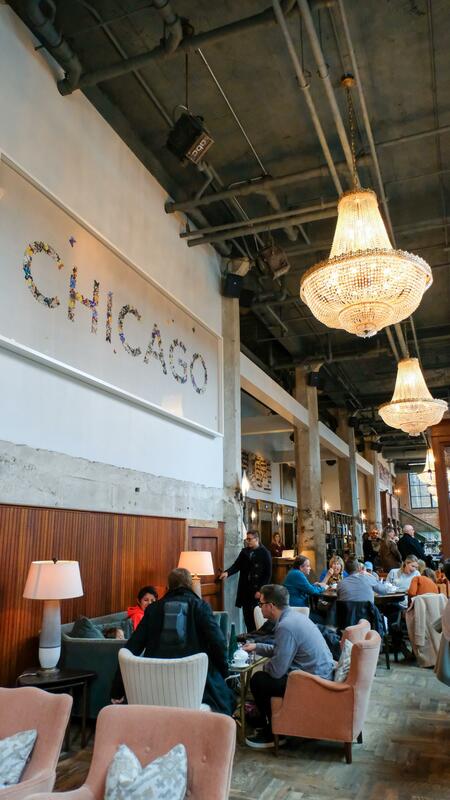 Your perfect Chicago trip planner! 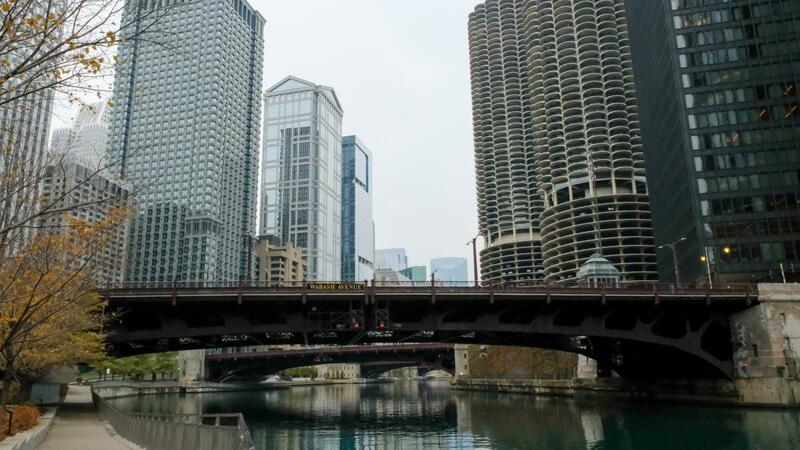 I’ve mainly included Chicago activities that I personally found worthwhile as opposed to the typical, popular tourist destinations (e,g, The Tilt at 360 Chicago, Giordano’s deep dish pizza, etc.). There’s obviously so much more you can do and countless things to see in Chicago that one weekend probably isn’t enough for it all. Also keep in mind that depending on the season of your visit, Chicago may or may not have a lot going on. I say that coming from experience, as my trip took place during Remembrance Day (Veterans Day in the U.S.) long weekend in November. It was far too cold for outdoorsy activities (e.g. boat rides or rooftop bars) and a lot of the famous fountains were closed (Crown Fountain and Buckingham Fountain). 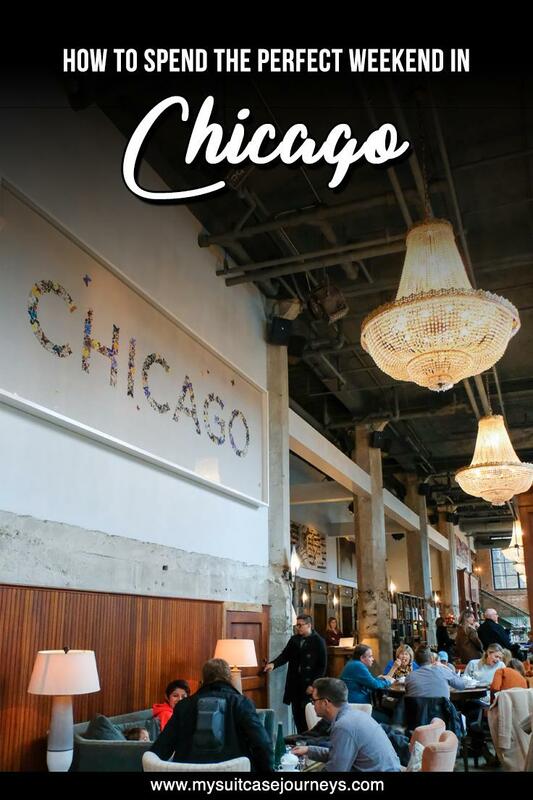 That said, this Chicago trip planner is aimed at helping you narrow it down to the top things to do in Chicago given a 48-hourish time frame from Friday night to Sunday afternoon. Hopefully you guys will enjoy this guide and find it helpful! This is a very good plan for a 48 hour visit. We spent the whole week in Chicago back in 2013 but I feel like we saw what uou suggested and not much more than that. Great hotel idea and the hot chololate place as well. Very helpful post. We loved Milleniuk Park! Hahaa the pineapple is definitely what attracted me to the hotel 😉 And after my Chicago trip, I realized I’m not much of a big city vacation type person either. A weekend visit will suffice! I was just going through your post when I got to the Nutella cafe part! Oh my, I’d love to try that coffee with it. Didn’t even hear about it, just like you didn’t before asking about things to do in Chicago. 😀 Adore crepes with Nutella anyway, so this would be a great stop. 😛 I’d probably enjoy walking along the riverfront, looks amazing. 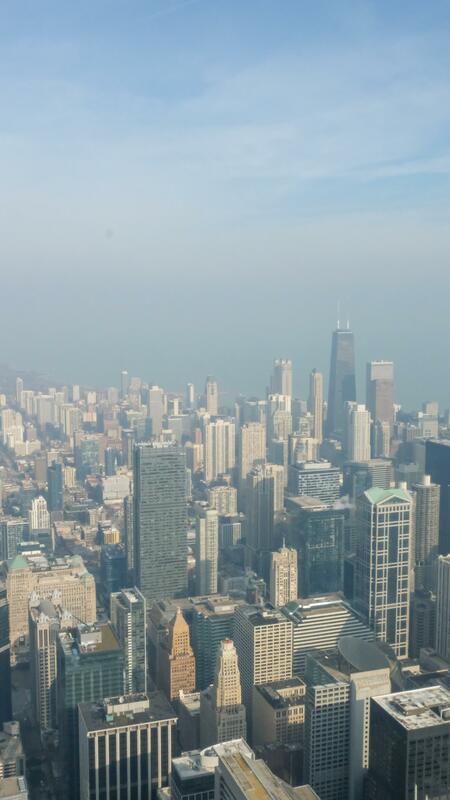 And the view from the Willis Tower’s Skydeck?! Wohoo, what a scenery! 🙂 Would have to put all these on the paper, this sounds like a nice list! So glad you enjoyed the guide, Danijela! 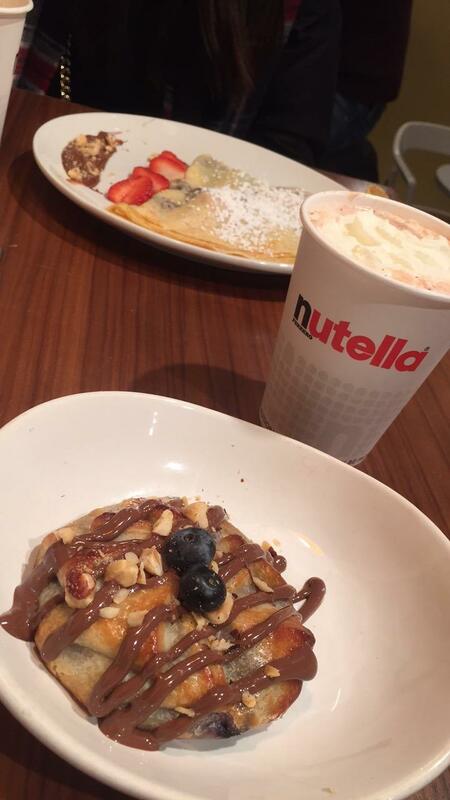 The Nutella Café is for sure a must. If you ever do go though, try to get there early in the morning otherwise they become super busy with lines out the door! I love to stay in boutique hotels when I travel-they have so much more character than gigantic chains! I didn’t love Chicago all that much myself (though I feel that way about all huge industrial feeling cities) except for the dining options which are fantastic :). 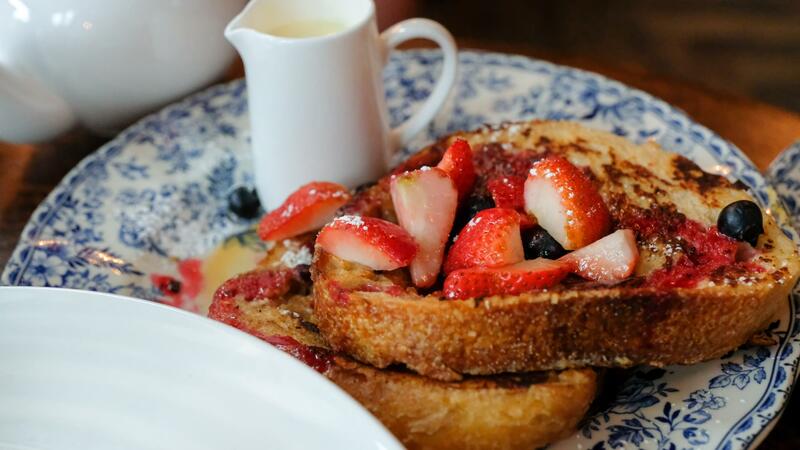 Your brunch spot looks fab too! What a perfect getaway this is! 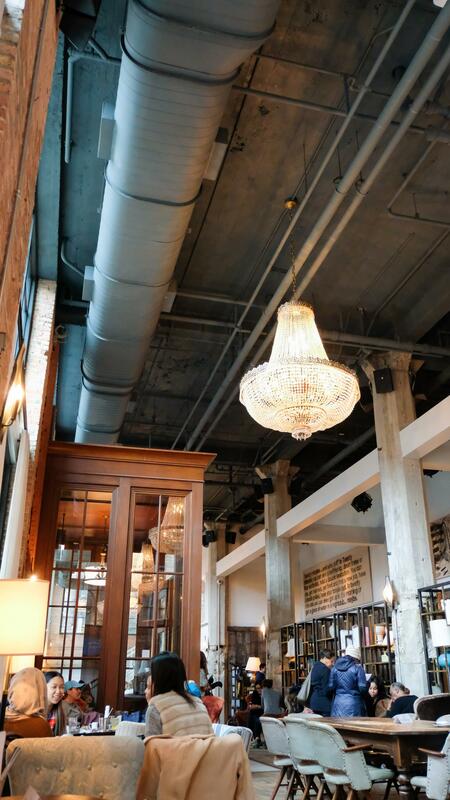 The boutique hotel looks so chic! 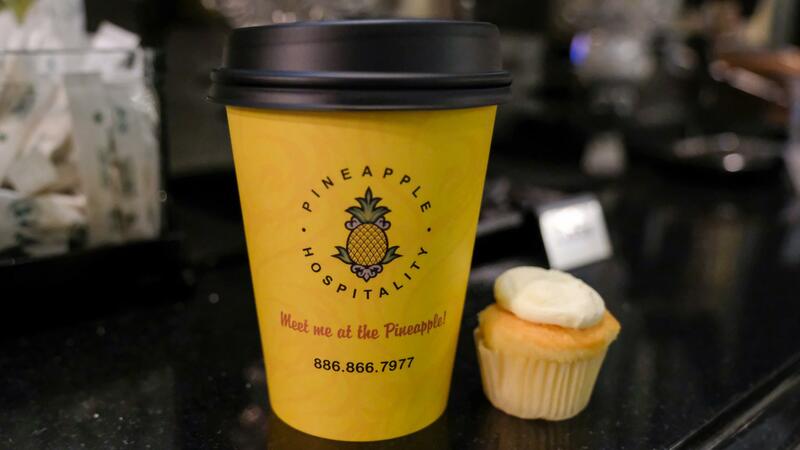 and Daily complimentary coffee and cupcakes from 3:30PM to 6:30PM sounds AWESOME! 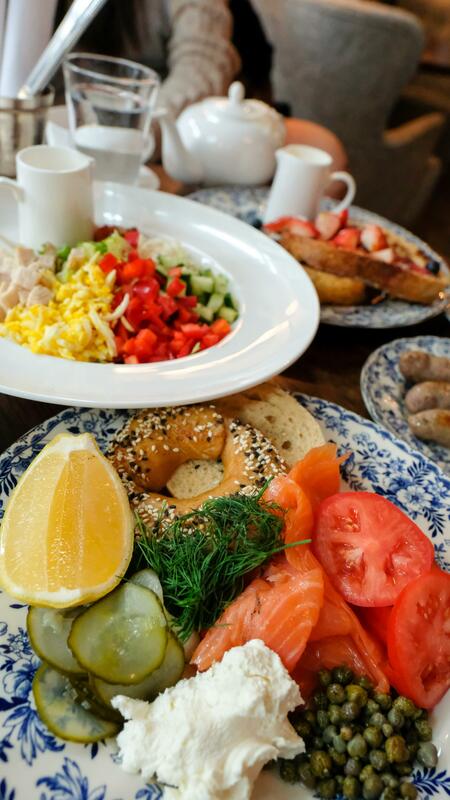 Loved your pictures especially of the brunch. Thanks Divyakshi! Brunch was seriously UH-MAZING. Hope this will inspire you to visit Chicago! I currently have a travel link up going on and this post would be a great addition! If you want to join in the fun, the blue “add your link” button is towards the bottom of this post (http://www.lifessweetwords.com/2017/12/traveltuesday-23-our-makers-mark.html ), just before the comments! Thank you! We are!! Hope the same for you 🙂 Happy Holidays!! Happy New Year Melanie! May 2018 be an even more eventful and prosperous year for you!! Ive always wanted to visit Chicago! I can’t believe I didn’t manage to do it while I was living in USA! This hotel looks so amazing! Love those pineapple accessories! And Nutella cafe? Wow thats sounds soo good! Love your photos! So beautiful! Thanks Ada! And oh no you missed out! I’m sure you’ll still get a chance to visit the States though and you could perhaps check off Chicago on your next visit! I’ve read your previous post on Chicago tourist traps and I’m glad to know that you have found several great things to see over the weekend in Chicago. 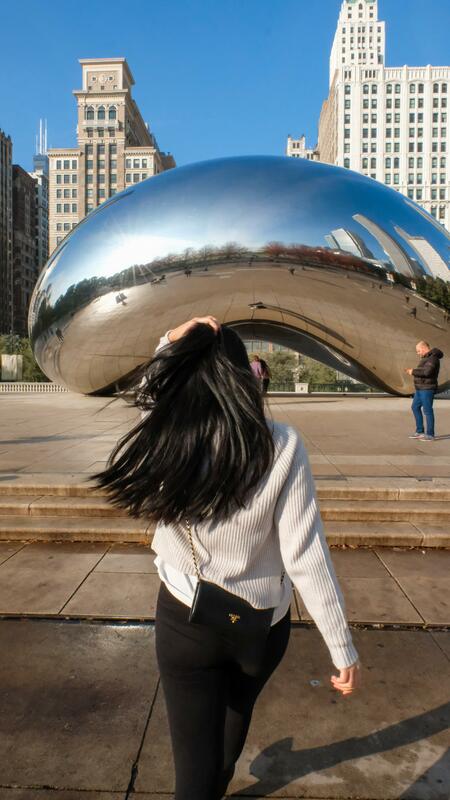 🙂 I generally enjoy visiting big cities over weekend breaks so it’s good to know that Chicago does have a lot of cool places to check out.. Would definitely love to check out Nutella Café and of course the Millennium Park! This is a great guide. 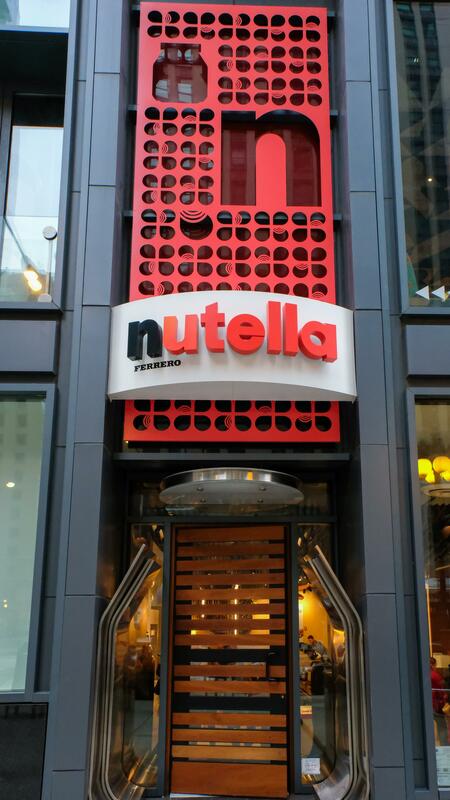 We go to Chicago regularly and have gone to a number of these sites, but I’ve never tried a Nutella cafe. How have I missed that? It’s definitely on my list for my next trip. I definitely need to get to Chicago! Dont know how I missed this great US city especially when the flights from New Orleans are so cheap. I think I would love to eat at the Allis. that food looks amazing. The Nutella Cafe is awesome. They had similar Nutella stores all over Porto and I must have visited at least once a day cause…NUTELLA! Love all the street art in Chicago too. Grafitti Murals always amaze me. I also read somewhere that Chicago has beaches that people go to during the summer month too. Ugh, need to go soon! Oh man… bummer! I totally would’ve taken advantage of the cheap flights, as you can imagine, flying from Vancouver to Chicago isn”t exactly wallet friendly. And yes, Chicago has beaches! I didn’t include it here, but in my “6 Chicago Tourist Traps to Avoid” post, I had a picture from Chicago360 that showed a beach view. That said, I definitely recommend visiting during summer when it’s warmer for all these fun, outdoor activities! 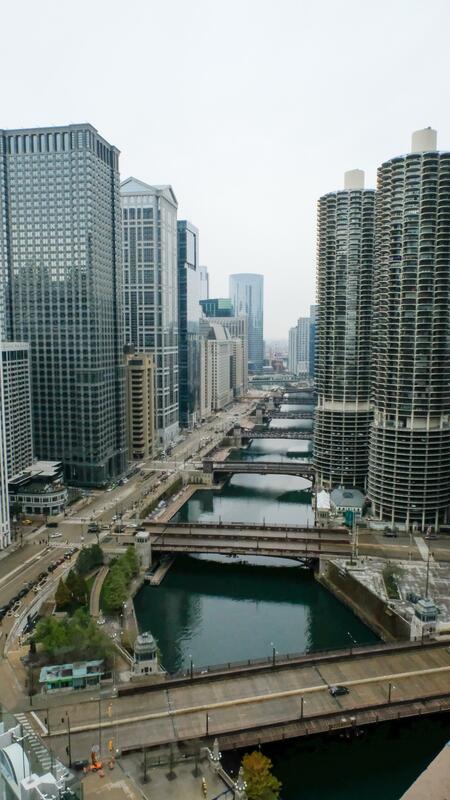 In Chicago, Riverwalk and rooftops are my favorite places. It is such a pleasure to walk next to a water body and rooftops give you the vertical view of the city. I seem to have missed all that lovely street art and wall murals. Looks like Chicago has changed in last few years and I must revisit it. 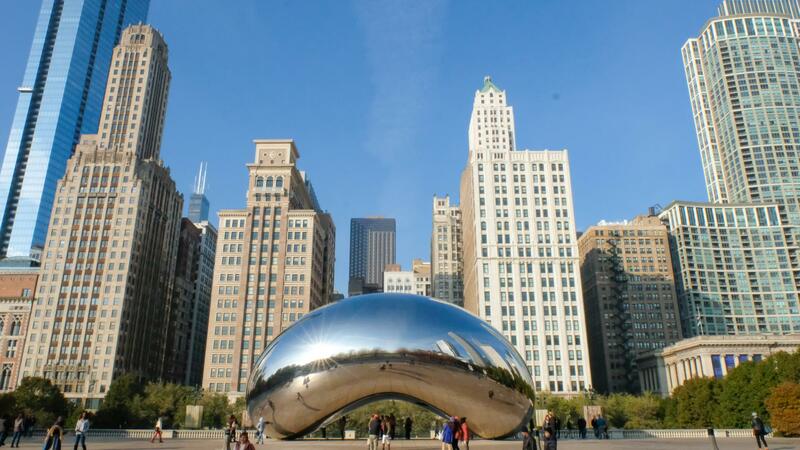 I have only known about deep dish pizza and the Cloud Gate by Anish Kapoor in Chicago. Your post has given me some new thoughts – I would love to visit some of the rooftop bars and enjoy the skyline, my daughter would love the Nutella Cafe. 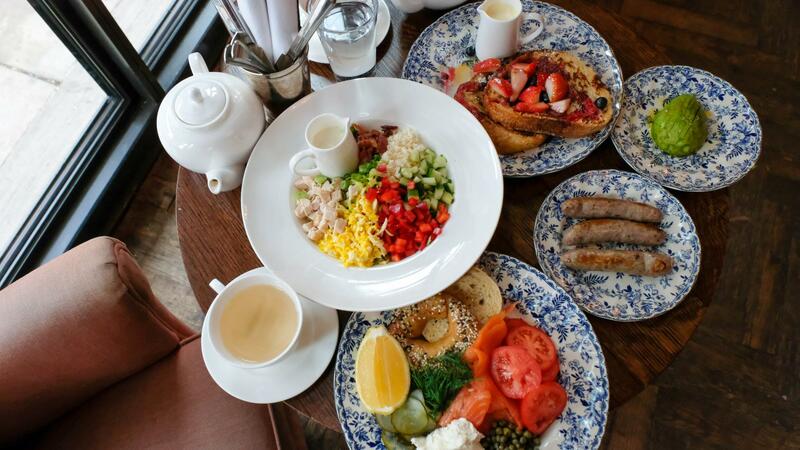 The brunch at Allis Soho seems interesting. 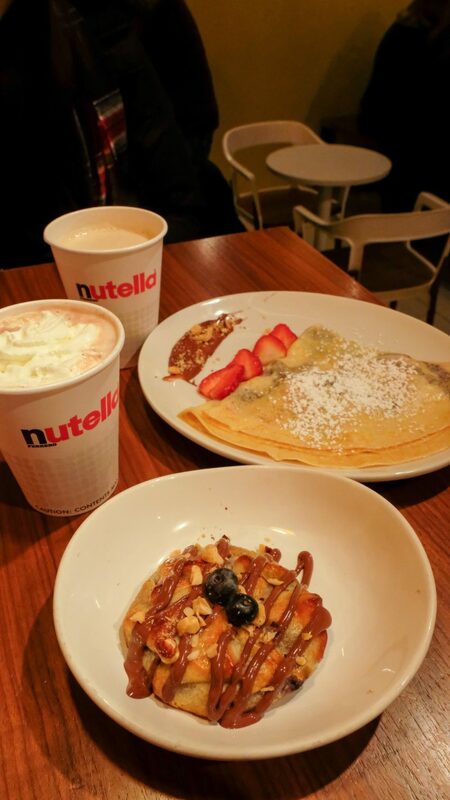 The Nutella Café is definitely a family-friendly spot to take the kids to. Your daughter would absolutely love it. And I haven’t been to the rooftop bars just yet so if you visit, you’ll have to let me know if you like them!!! Ah no way! I was in Singapore a few years back. Should’ve hunted down some delicious Nutella treats while I was there!!! Yup this is pretty much on point. Nutella Cafe is the way too go! Who doesn’t like Nutella, right!? These are fantastic suggestions! (I also read your post on Chicago’s tourist traps, so I know what to avoid as well!) I especially love the murals! Really, all of your photography is fantastic! The Nutella Cafe just made the list. We just did Bailey’s Chocolate fondue this afternoon but that still sounds really good, I love a good cup of coffee. I love a good cup of coffee with Nutella even more. Super yum. The hotel looks super cute! Housed in a historic building would mean, that’s totally my kinda place! Nutella cafe? That would be my heaven on earth! The Alise has amazing service too, not just history. I highly recommend staying with them if you ever visit Chicago! 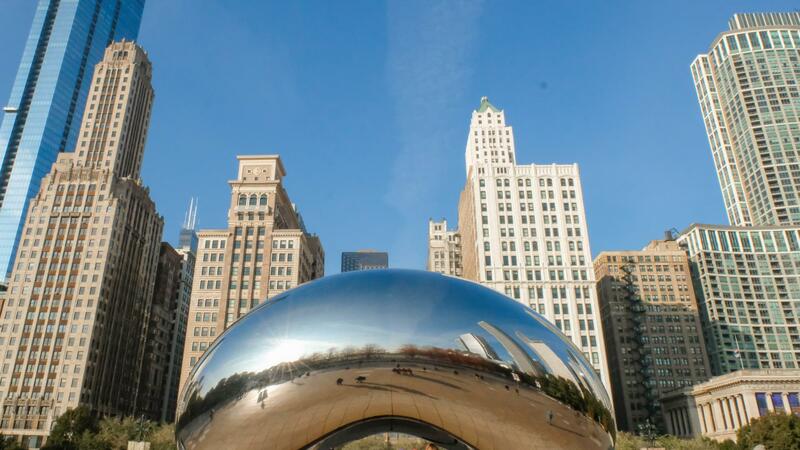 Lots of fun things to do it in Chicago! You looked like you had packed solid weekend. 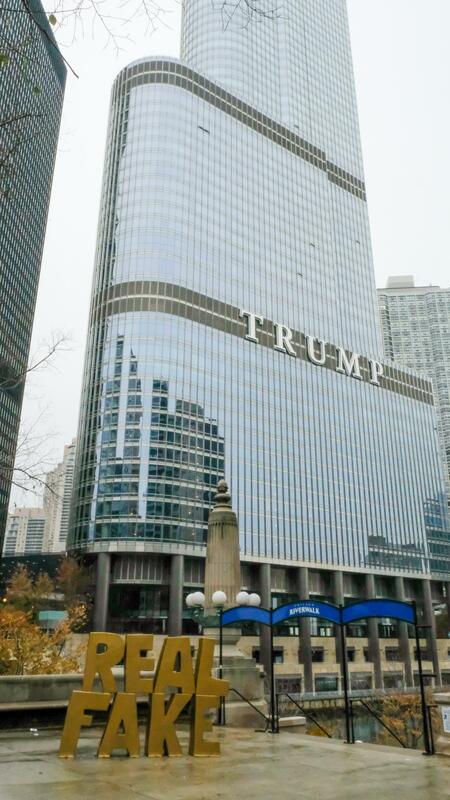 My cousin has recently moved to Chicago and has been convincing me to go visit. With your post, now I have a good idea of how to spend a memorable 2-3 days in the city. Sounds lovely and refreshing. Ahh that’s awesome! Chicago is apparently more fun if you have a local show you around. Not sure how long your cousin’s been there, but I bet he/she will have an even better idea of where to take you around the city! wow..this seems like such an amazing vacation..eat, sleep, chill , explore repeat.. i would luv to have such vacationa nd chicago looks like a great option..i luv ur photo in the bed .. This is what I would call a perfect weekend. Starting with a comfortable stay in Alise, the boutique hotel, a packed day with so many exciting stuff to experience. The Nutella cafe does sound out of the world! Cloud Gate looks really marvelous and a tribute to the innovative creativity of the architect. So, we are from Chicago and there are a few things we haven’t done yet! LH Rooftop sounds like THE place to enjoy a drink and a view plus the NUTELLA SHOP! I had no idea they opened one. I texted my sister immediately to make a date to check it out. Thanks so much!! Hahhaa omg you’re too cute! The Nutella Café just opened in 2017 so still fairly new. Hope you girls will get to check it out soon!! 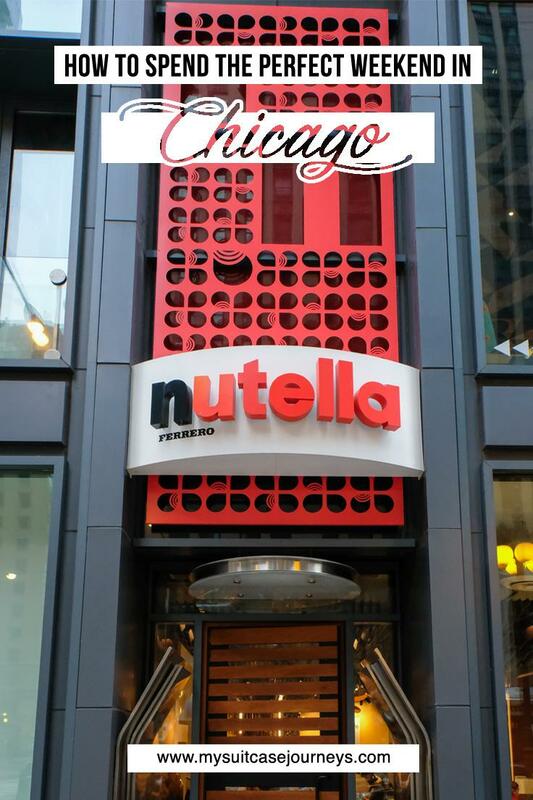 I might be heading to Chicago next year so this has been bookmarked!Nutella cafe?! I did not know this! That’s a must visit! It’s a must for sure!!! So glad to hear this guide could be of help to you. Let me know if you have further questions and enjoy your trip!! 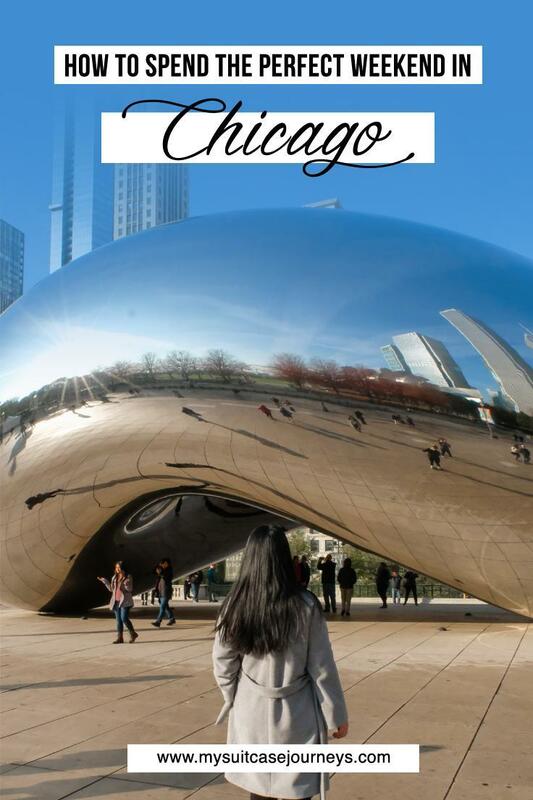 Great guide, I’d really like to visit Chicago, I have friends who’ve lived there and recommended it and your guide is making me want to go too! Your photos are fantastic, especially of the murals! Chicago is such a great city! We live about 6 hours away so it’s a great spot for us to road trip to! 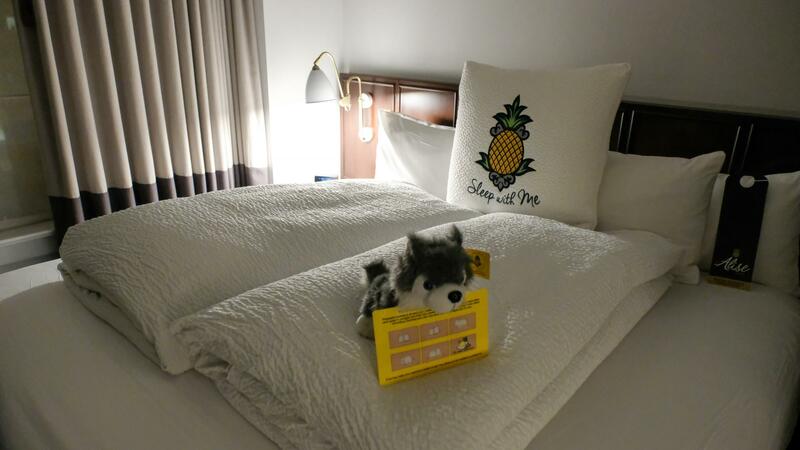 The Alise Chicago looks like a really great hotel—love all the cute pineapples! We really need to get to the Nutella Cafe. I think the last time we visited was right before it opened. It sounds so amazing! The SNL experience sounds really cool, too! Looks like we need to plan another road trip! Oooooo definitely sounds like you guys could use a road trip revisit. 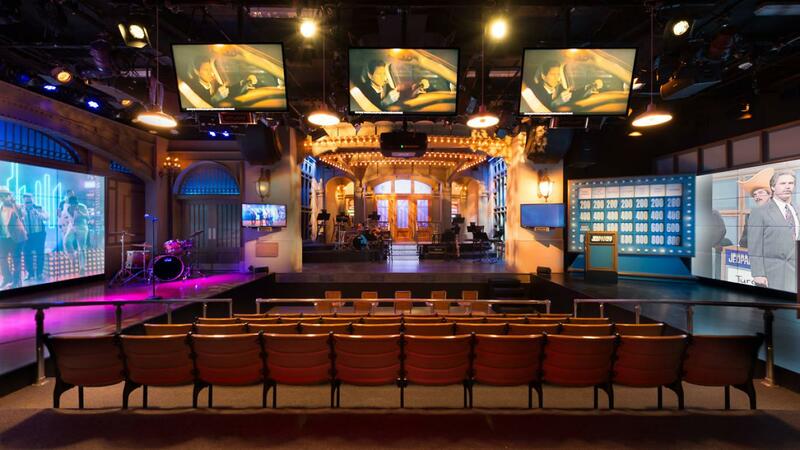 I haven’t been to the SNL exhibit but let me know your thoughts if you guys decide to go! I just love a good rooftop bar so thank you for recommending London House Chicago! I’ve actually never visited the Windy City and will certainly have to wait until the cold weather disappears! Adding all these spots to my list, especially that beautiful conservatory. If you visit LH or the conservatory, let me know! I’ll have to live vicariously thru you!! My daughter and I are headed to Chicago (well, Evanston) next month. I can see a visit to the Nutella Cafe in our future!! Great article! Thanks Becki! I would’ve offered to send you a couple more recommendations, but I’m only seeing your comment now. Hope you had a fantastic trip nonetheless!!! Nice reading your list of things to do in chicago. I can’t agree more with your choices. This looks like a lot of fun! I’ve been to Chicago twice and always have a great time. 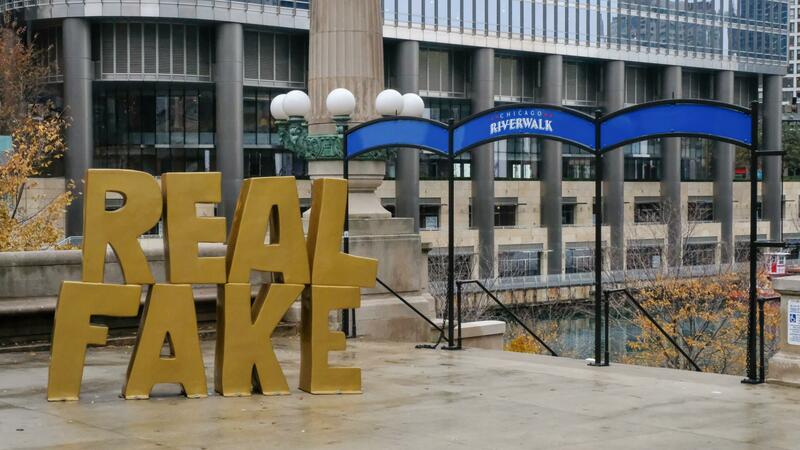 I enjoy the River Walk and “the Bean” too. But I’m bummed that I didn’t see the SNL exhibition. I’m a huge fan! At least I got to see a Second City Show. Oh no! You’ll definitely have to check out the exhibition next time and let me know what you think of it! !